"The world of Hindi films is a world of incomplete people. Here, when two people come together, they don’t multiply. They become one." To pre-millennial urban Indians who grew up reading mainly in English while also watching Hindi cinema, Rahi Masoom Raza is best known not as a novelist and poet but as the dialogue writer of the 1980s television Mahabharat, as well as many 1970s and 1980s movies. Looking up his filmography, I was delighted to find that in addition to winning awards for reasonably well-respected films like Yash Chopra’s Lamhe and Hrishikesh Mukherjee’s Mili, he worked on some of my more disreputable childhood favourites such as Dance Dance and Adventures of Tarzan. But Raza was also a “serious writer” (in the generally used, narrow sense of that term), the author of acclaimed books such as Aadha Gaon and Topi Shukla – and like many others negotiating the world of commercial Hindi cinema, he would have had to balance his individualistic side with the more formulaic demands made on him. In the best cases, such marriages could result in fine films which combined surface lightness with thematic depth, bringing together the strengths of two mediums. In many other cases, a writer could feel stymied, exploited and unappreciated. This conflict informs his 1977 novel Scene 75, which has just been translated into English by Poonam Saxena, and in an early passage of which we find a writer struggling with a film scene. But he couldn’t understand “Scene: 75: Day: Post Office”. And [the director] was not wrong in asking him why he couldn’t understand it, because were there any scenes in commercial Hindi cinema that one couldn’t understand? The scene in question involves Sanjeev Kumar playing a roadside munshi and Leela Mishra as an old woman dictating a letter to him; the book will have many other references – including some very funny ones – to real-life actors and writers (even Raza himself). 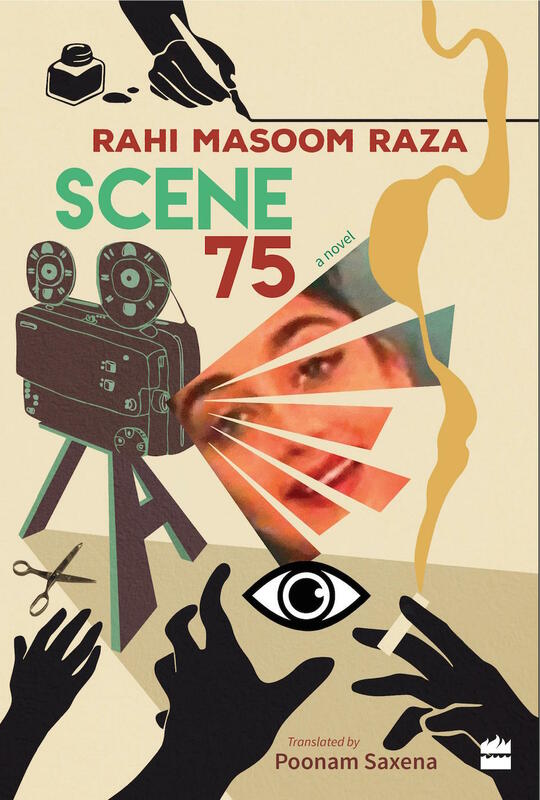 Scene 75 can broadly be described as a story about a writer named Ali Amjad, who comes from Benares to Bombay to work in films. That synopsis doesn’t begin to convey the book’s tone and effect, though; this slim, conversational novel is also a complex beast that demands a reader’s full attention. This is because Raza approaches his themes (the marginalization of the writer, the many duplicities of the world) in a roundabout, non-chronological way by evoking the world around Ali Amjad, including the many colourful personalities whose lives are interlinked: his three roommates in the guesthouse he stays in when he first arrives in Bombay, his neighbours in the housing society he later moves to. In fact, for large, entertaining chunks of the book, we barely hear anything about its “protagonist”, but we know he is around, watching and absorbing. The things he sees and hears provide him with material as a writer, but also add to his despair. The book’s preface includes these lines from a Raza poem – “Whoever you see / Whoever you meet / They seem like someone else / In this neighbourhood / It’s as if no one has an identity” – and the question of identity runs through the story. People wear masks, pretend to be what they are not. A Muslim adopts a Hindu identity so he can get a job in a prejudice-ridden society complex. A Hindu wears a suit and a new name and goes to church with his Catholic girlfriend. Neighbours become secret lovers while maintaining outward facades. A long-married woman is a lesbian who slides her hands all over a friend’s body on the pretext of teaching her how to tie a sari properly. (The friend gets something out of it too – she learns how to tie a sari.) A young woman begins an affair with one of her father’s employees, and is soon in something close to a ménage-a-trois with her own mother. It’s just about possible to imagine some of Scene 75’s characters, their activities toned down, glimpsed on the periphery of a 1970s Hindi film – the many residents of the multistoreyed building in Mili, for instance, each bearing quirks and secrets. But there are scenes and lines in this novel – as it portrays religious and class divides, social aspiration and sexual transgressions with sharp, dry humour – that you wouldn’t find in a mainstream Hindi film of the period. Besides, the narrative structure is closer to other, more experimental cinemas of the time: like Luis Bunuel’s The Phantom of Liberty or The Milky Way, which follow first one set of characters, then take a sudden detour to track someone else, and so on (“it's like the camera is telling the viewer, hmm, this new person might have an even more interesting story, so let's take a chance and see what he's up to," Bunuel’s screenwriter Jean-Claude Carriere told me years ago). For example, at one point in Raza’s novel, two friends are laughing about something but then the narrative takes us into the kitchen of the same house where the maid is also giggling with her boyfriend – and then we get the back-story of this new character. Which means we must follow the narrative closely to figure out what is happening at what point, or whether we have returned to the present from a flashback. Lisa placed her hand on Ramnath’s lips and he kissed it. He had learnt all this from watching Hindi films. “In my heart,” Ramnath said, thumping his chest. Ramnath had no answer to this question. Eventually, in a surreal yet credible turn of events, Ali Amjad finds himself working as a scriptwriter not for movies (good or bad) but for a beggars’ workshop. This makes a poetic kind of sense, given everything that has preceded it. And it leads to a melancholy, dreamlike final segment that prepares us for a writer’s death. The question of how he dies, and whether the death is literal or metaphorical or both, is almost irrelevant. The bigger question – addressed in the book’s searing final paragraph – is: does anyone care? Just put this on my Amazon list - I look forward to reading it. Excellent intro to the book! Reading this one in its original hindi right now. The non linear fashion of story telling does make it difficult at times but the tone and language is so matter of fact and funny.